More Than Simply Wishing Well; Wishing Awesome! Whether accompanied by a card or plush animal and whether sent to their home or hospital room, everyone welcomes a “get well” wish when they’re feeling poorly. It lets them know their smiling face and energetic personality are missed among their friends. Our state of mind can have a significant impact on the speed with which we recover. Knowing your friend’s character and the nature of your relationship will help determine whether a faith-filled, traditional, or humorous note would be most effective in cheering them on their way to recovery. A scripture quote may be just the thing to give Grandma a boost in morale, or an off-color joke might get your fraternity brother up and feel ready for the next party. Below is a list of more than two hundred uplifting get well wishes, messages, and quotes for you to personalize. They’ll undoubtedly inspire your sick friend or loved one back to health in no time. I want your recovery to be faster than a child running to buy ice cream on a hot summer day! Get well soon buddy! 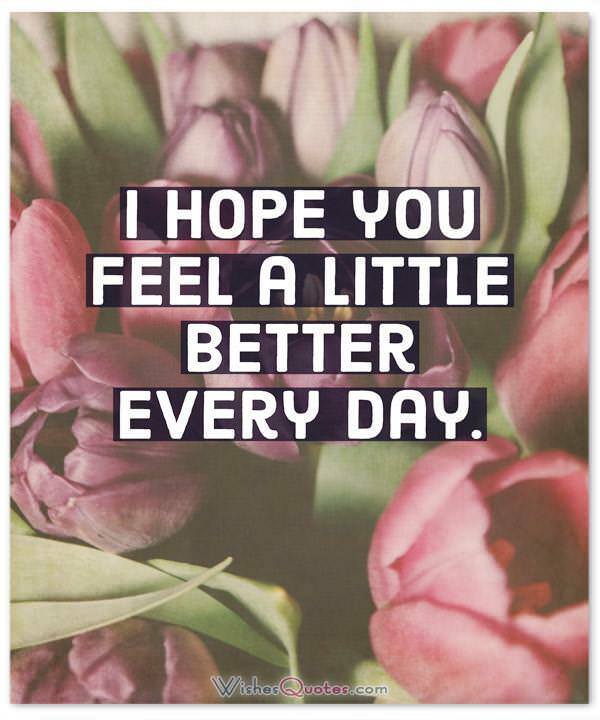 I hope you feel a little better every day. Hang in there, better days are coming. I hope each new day brings you closer to a full recovery! 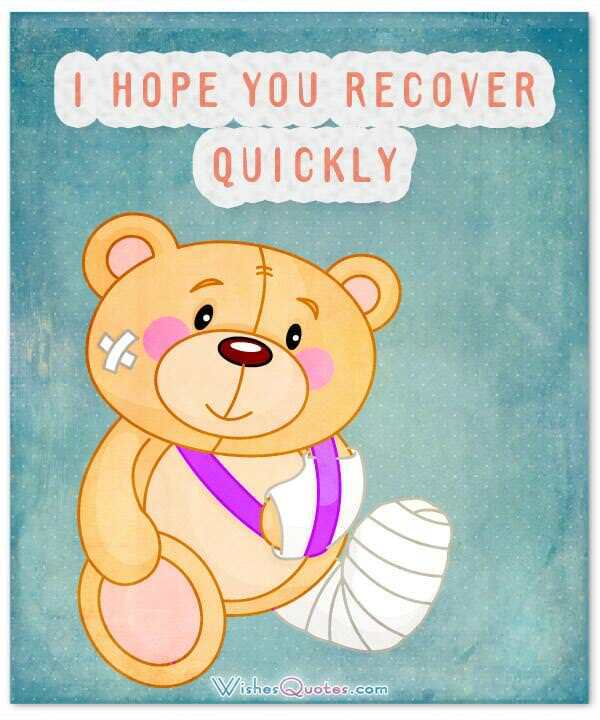 Wishing you a speedy recovery. 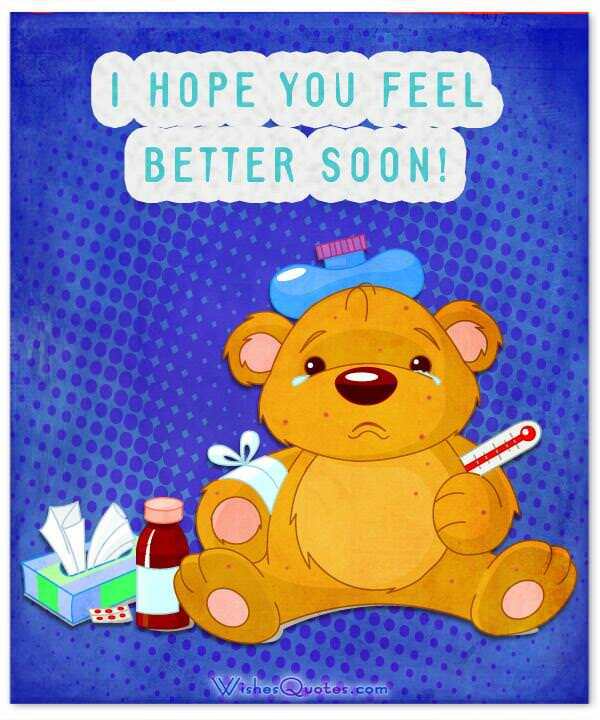 I hope you feel better soon. It’s been so lovely seeing you every day, with your humor and kindness, but it has been so sad not seeing you. Being ill and out of commission is hard on anyone. Everyone here sends best wishes for your health and healing. Take all the time you need to get well, and know that, when you return, there will be many happy faces waiting to greet you. Get well soon! Everyone here misses your contagious smile. Nothing has been the same since you became ill. No one tells a joke as you do, so please hurry and get well fast! Get well soon! Your family and friends miss you a lot and I look forward to your return. We all send our best prayers to you, and want you to know that you are greatly missed! So, take good care and return to us soon. The old song goes “…ain’t no sunshine when you’re gone…”? We miss your sunshine so get better and get back to us really soon, okay? Hope you’re out of the hospital soon, though I know you’ll miss those complimentary massages. What — you didn’t get the massage? Now that you’re sick, at least try to make the best of your time and do something creative! Like watching cat videos on the internet! On a more serious note. Try to get some rest so we can have you back as soon as possible Get well soon! I wish I could take away your discomfort but, instead of that, please know that I’m thinking of you and cheering you on to a speedy recovery. Sending you love, well wishes, prayers, and every kind of good energy to bring you back to health as soon as possible. Love you! People here are missing you so much, especially your kindness and humor. Please recover quickly from your illness. We are praying for you day and night, friend. I’d like to give you a big sloppy kiss to make you feel better, but then I’d get your germs. So, I’m sending an imaginary get well hug! May your illness pass as harmless as a summer breeze my friend. Can’t wait to have you back! Get well soon! I was so sorry to hear that you were taken to the hospital last night. Let me convey my best wishes for a quick recovery from your illness, my friend. Best wishes. I hope that you’re back in the swing of things very soon. It seems that “get well” isn’t quite enough to say, so I’ll add a “SOON” so you’ll come on out and play. 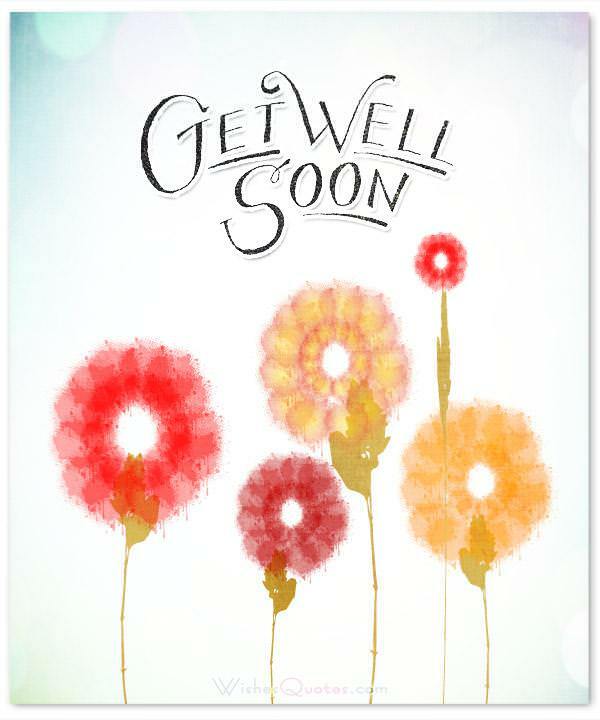 Get well soon messages are often just the right way to show a friend or family member that you are thinking of him or her during recovery from illness or an injury, especially if you cannot be there in person as often as you would like. 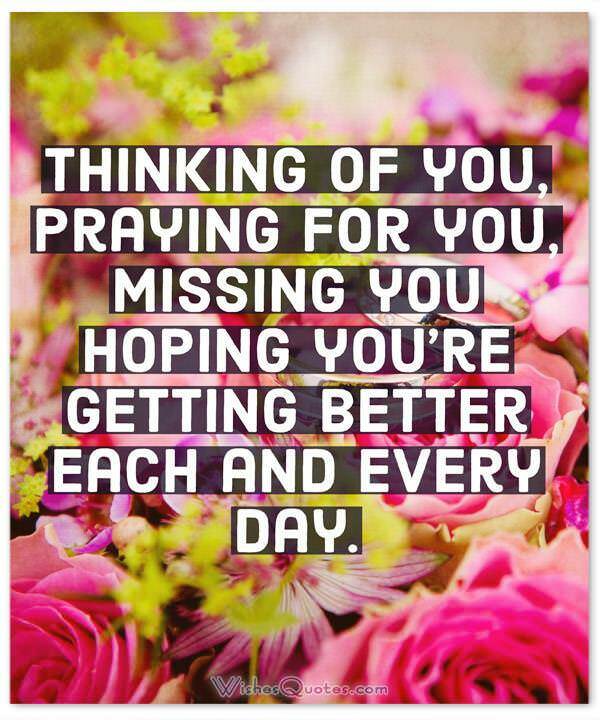 In the following list of greetings and quotes, you will find the get well soon wish that will bring a smile to your loved one’s face. The right message can relay the sincere wishes you want to get across for his or her continued recovery. Whether you want to look through a list of wishes that are funny or send along a card with a more sincere tone to its message, you can find it here. We have a wide variety to choose from and know that you will find just what you need to fit the occasion. Send your heartfelt wishes along with a bright bouquet of flowers, a box of chocolates, or a cozy stuffed animal your loved one can keep for a lifetime. Cheer up! 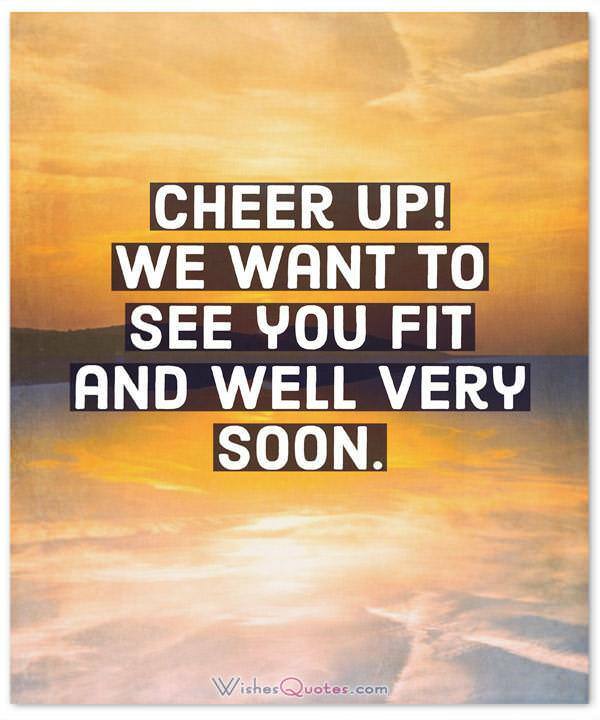 We want to see you fit and well very soon. I will continue praying for your good health and speedy recovery. I know how annoying your condition is, and it’s terrible to see you like this. My thoughts and prayers are with you, my I hope you get well soon! May you be blessed with good health and a quick recovery. Say goodbye to that bout of ill health, and get well soon. The most important thing when facing illness is that no matter how bad it gets, you should never lose hope. Faith is the first step to recovery. Get well soon my friend! Since you’re under the weather, take this time to practice meditation and spiritual focus. Or you can just torment your cat. Feel better soon! Everyone here at work is doing our best to “hold down the fort” while you’re recuperating, but there’s a severe shortage of fun! Come back soon, please! You’ve always taken such good care of me, so I’d be privileged to hasten your recovery in any way. What do you need to get better? Let me know, sweet friend. I wish I were a magician so I could make you fit and healthy with the wave of a wand! I will stand beside you always. Wishing you good health and a fast recovery. Feel better fast so I can see you again soon! I miss you so much! 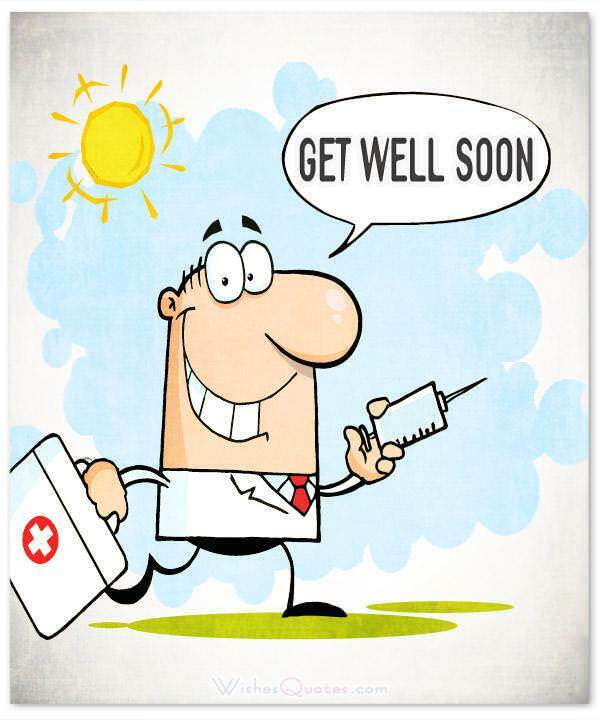 I hope you get well really soon! I miss your smile! I pray God heals you quickly with His miraculously healing hands. You can get better fast! Just do it! 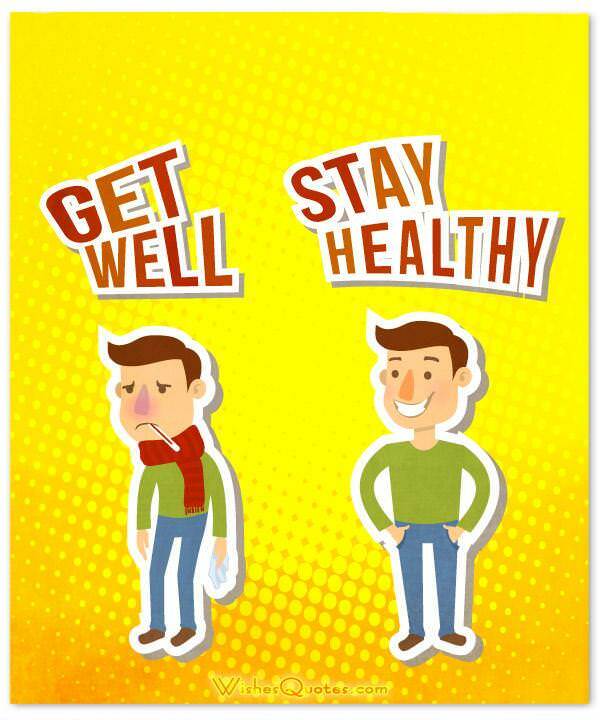 Be well! I am sorry to hear of this tough time for you. You’re in my prayers. 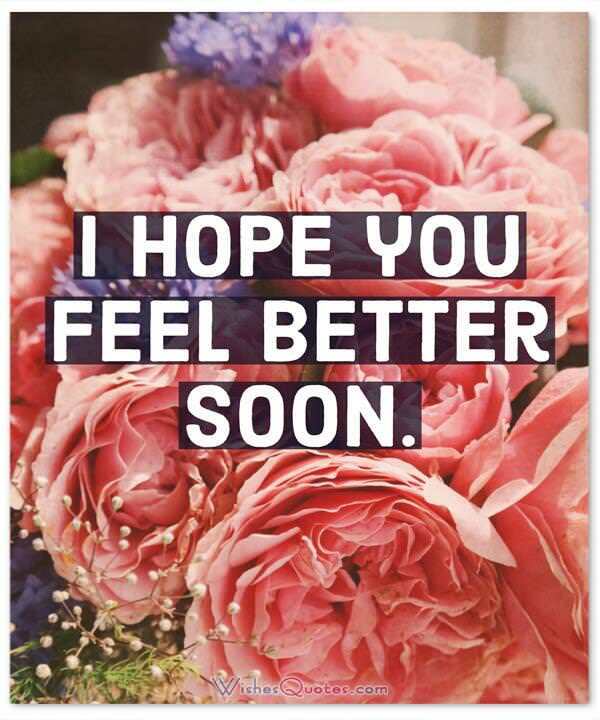 I hope you feel better really fast. I’m counting the days until I can see you again! I heard you were in pain. Well, don’t focus on it (LOL, as I mention it). No, really: think pleasant I love ya! 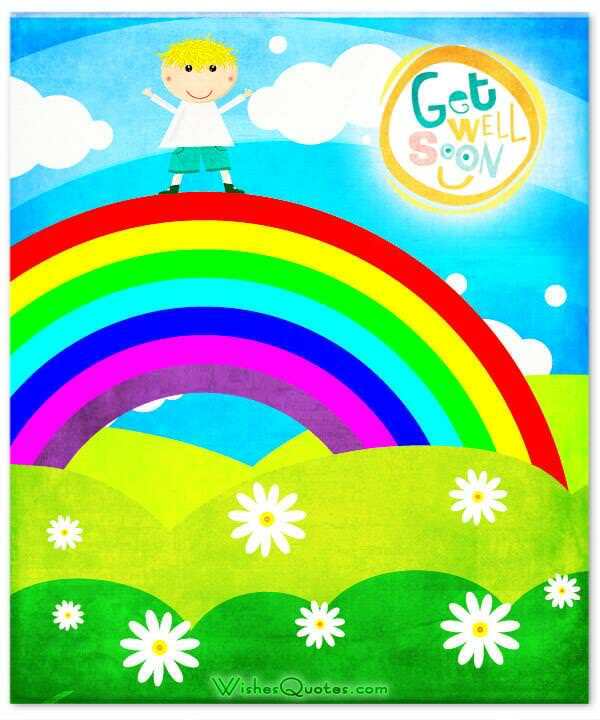 Get well soon! Remember to just take it one day at a time, and, in no time, you will be completely healthy and smiling once again. 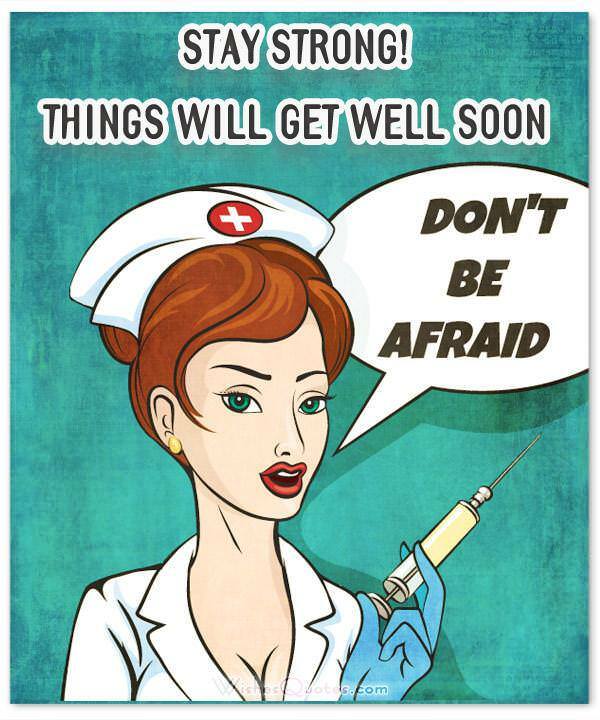 I hope this “get well” message brings a smile to your face. You are too beautiful to be feeling down. Do what the doctor says, and feel better soon! I can’t wait to see you again. I ache every second you are sick, and pretty soon I am going to be in that hospital bed next to you. Get better fast, because, even though I love you, I don’t want to join you. You will do more than just get better; you will be better than you were before. I can’t wait to see you soon in full health. Focus on the future and concentrate on getting well. Here’s to good things happening in your life. May every cell in your body heal miraculously fast. Know that you are missed greatly. May God bless you with good health and peace through this hard time. Know that I am here for you if you ever need anything. If you ever need to talk, I am always here to listen. May your tears of sorrow quickly become tears of joy. I am so sorry you aren’t feeling well. I pray you to recover to full health soon. Think healthy, lovely, beautiful thoughts, and may your ails cease to exist. Even Superman has a weakness. Though you are feeling weak now, know that you will be strong again. Until then, may peace be with you. I would wish you well, but I know you don’t need any wishes because you WILL be better soon. This is me letting you know that I’m thinking about you. We should not give up, and we should not allow the problem to defeat us. Although the world is full of suffering, it’s full also of the overcoming it. Be strong because things will get better. It may be stormy now, but it never rains forever. Today, I am going to let my burdens go. I am going to face this day and have faith that everything will get better. A character cannot be developed in ease and quiet. Only through experience of trial and suffering can the soul be strengthened, ambition inspired, and success achieved.